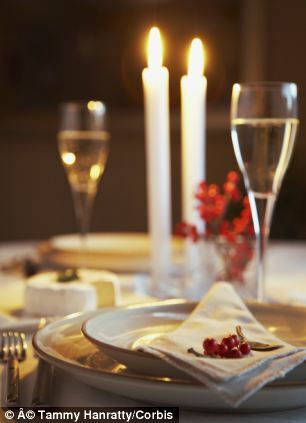 Candlelit dinners really could be good for the heart, new Swedish research has suggested. A candlelit dinner works wonders for romance.Now scientists say it could also be good for your heart.Breathing in candle smoke causes beneficial changes in cardiac rhythm, they claim.It is thought that tiny salt particles released when the candle burns are behind the effect. The researchers monitored the hearts of 13 men and women as they breathed in air pumped into a small chamber. In some cases the air included smoke from candles in a second room.The volunteers didn’t know which type of air they were breathing, but when it included candle smoke, their heart rate variability improved.Everyone’s heart rate varies naturally all the time, beating a little bit faster when we breathe in than when we breathe out. This is perfectly healthy and a sign that the brain is alert and able to regulate the heart. But this variation falls as we get older and if we develop heart problems. In the study, it was increased by inhaling candle smoke. Researcher Christina Isaxon from Lund University in Sweden said the concentration of smoke generated during the study was similar to that created by a candlelit dinner. As the volunteers could not see the candles and weren’t told what they were breathing, the effect could not be explained away by the calming effect of candlelight .Dr Isaxon said she thought tiny particles of sodium and potassium, which along with soot, make up candle smoke, could be responsible for the beneficial effects.The two elements are involved in regulating the heart’s rhythm and in sending messages between cells in the body.More salts are produced when a flame is still so she recommends that candles are burned away from drafts. Breathing in candle smoke causes beneficial changes in cardiac rhythm, the study found. The study, carried out for her PhD, did not find any negative health effects of the smoke – although Dr Isaxon admitted said she did not ‘make a huge effort’ to find any.Soot, which increases when the flame flickers, has been blamed for health problems in the past.The American Chemical Society has warned that paraffin wax candles, the most common type, release potentially harmful chemicals linked to cancer, asthma and eczema. It recommends using beeswax and soy candles.Dr Isaxon used candles made of pure stearine, a natural fat, in her study. Many other types of candle also contain some stearine. Dr Isaxon found paraffin wax candles which had stearine in them also released potassium and sodium particles. Stearine candles were first developed 200 years ago.They are very popular in Scandinavia and can be bought here from retailers including Ikea.Dr Isaxon recommended using candles that are as natural as possible and avoiding scents and dyes as they may give off dangerous chemicals when burned.Since we spend more than 85 per cent of our time indoors, what we breathe in at home is very important, she said. This entry was posted in interesting ideas, lighting, science, travel, Uncategorized and tagged History, science, Shopping, travel. Bookmark the permalink.